Outcast, whose second season began on Friday last week but which will air its second episode Friday, July 27 at 10 p.m. on Cinemax. The first season is available to rent on iTunes and Amazon or for free with a Max Go subscription. The second Robert Kirkman comic book to get transferred to the small screen, Outcast is far more supernaturally horror-minded than the writer’s undead-killing blockbuster The Walking Dead. The story follows Kyle Barnes (Patrick Fugit), a man grieving the separation from his wife (Kate Lyn Sheil)—a separation brought on by a violent encounter between Kyle and his young daughter, Amber, that saw his wife take the child away and the surrounding townsfolk of Rome, West Virginia shun him accordingly. Or so the official story goes. As it turns out, Kyle has been plagued by demons his whole life—and not metaphorical ones. Real demons, which have the ability to possess people, first took over a family member when he was young, and now have returned to menace him and his neighbors in the present day. After being pulled out of his isolation by his concerned adopted sister, Megan (Wrenn Schmidt), Kyle is soon teaming up with local priest John Anderson (Philip Glenister), as the pair discover Kyle might just hold the key to defeating the malevolent beings; he has the strange ability to cause demons pain when he lays his hands on them, and drive them from their human hosts. The first season concluded (spoiler alert) with Kyle and his daughter managing to pry a demonic spirit loose from his sister, freeing her from a collective of similar demons led by a mysterious man in a black hat (Brent Spiner) who appears hellbent on creating as many of the possessed as possible. Unfortunately, the rescue was bittersweet: Megan comes to and realizes she killed her husband while she was in thrall to her demon parasite. As season two begins, Kyle is reunited with his daughter, whom we’ve just learned may possess the same exorcism powers as he does. Kyle’s estranged wife has checked herself into a mental health facility, convinced her own possession was the result of mental illness. Anderson has lost faith in his role as a preacher, feeling God has abandoned him and his demon-fighting mission. And Kyle is feeling hopeless, the sheer numbers of the possessed—along with the fact that after they’ve inhabited a host for long enough, he can no longer exorcise them—contributing to his sense of futility at the fight. Too often, the genre components of a TV show are used as a crutch, something to turn to when the story fails to invest sufficiently in its characters and relationships. 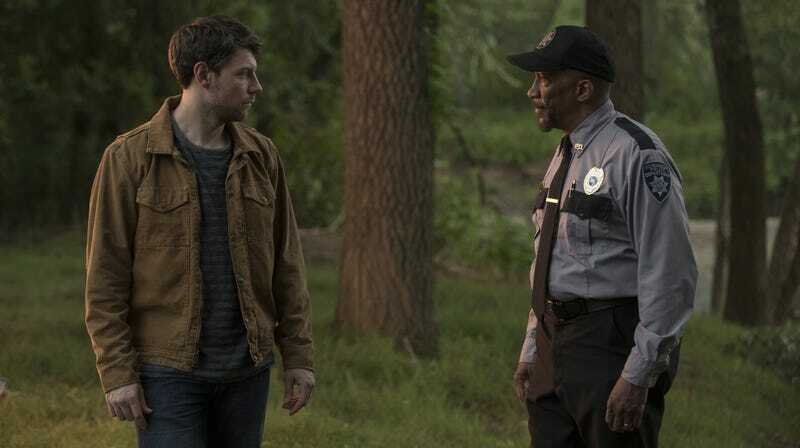 With Outcast, it’s the opposite: The series is interested in the consequences of violence, and the ways the small communities deal with the fallout from pain inflicted upon their members from outside and within. Sure, the trauma Kyle suffers may be mystical in origin, but its emotional ramifications are no different than they would be had he suffered some all-too-human tragedy. Each character in this story is dealing with loss in deeply relatable ways, the individual pains filtered through recognizably human responses, be it numbing the grief, repressing it, or throwing themselves full-tilt into it to the detriment of everyday functioning. The monsters are real, but the familiar coping techniques of everyday life even more so. Similarly, the citizens of Rome know something terrible is in their midst, but most of them lack the desire or courage to confront the collective pain festering below the surface of their town. It’s a willful ignorance (often combined with a genuine sense of community support and a hard-working ethos) that can be found in any number of decaying rust belt communities in rural America, the crumbling economic infrastructure replaced by religion, nationalism, anything to prop up a sense of hope or optimism in the face of increasing darkness. Outcast is the rare series that treats its working poor with understanding and respect, neither stooping to pity nor resorting to lazy stereotypes of its citizenry. People respond to Kyle and his gossip-spread reputation in different ways, but they’re mostly too consumed with their own problems to give it much thought. As the scope has expanded in season two to reveal the expanded range of the demonic threat facing Kyle and his allies, everyone—even the possessed—is granted small moments of character study, enriching and deepening the narrative in unexpected ways. The above makes it sound as though the show is some downbeat drama. It’s not. What keeps it crackling with tension and energy is the profound sense of dread generated by its premise and the abandon with which it throws itself into its horror. Outcast is actually scary, something very difficult to find even among shows based on traditional horror tropes. (Can you remember the last time The Walking Dead was scary?) TV horror often struggles for a few recurring reasons, often blending with other genres to create new hybridized forms. In part, there’s the built-in necessity of the commercial break that historically drained the potential for frights; while many shows simply adapted to the format, a home at Cinemax ensures that’s not a problem. Outcast can take its time, and build tension and dread without worrying it will be punctuated with an ad for tires. A lot of its haunting mood can be credited to director Adam Wingard (You’re Next, Death Note), who in the pilot episode established the tone and feel of the series in ways that manage to feel freshly menacing. Amid the washed-out colors and decaying buildings, Wingard created a show where the camera is constantly holding back, afraid to look around the next corner. Better still, when the scares come, they’re never telegraphed. As a result, you never know where or when an unnatural shock will jolt a scene out of its normal path, setting both characters and audience on edge. Combine that with the “anyone could be possessed” aspect of the story, and you’ve got a nerve-wracking viewing experience. Subsequent directors have picked up that baton and brought a creepy sense of style to the overall series. Yes, Data from Star Trek: The Next Generation is here, and he just might be the embodiment of evil incarnate. When Brent Spiner first shows up, literally wearing a black hat, his character, Sydney, had enough notes of ambiguity to leave you uncertain about why he had arrived in Rome. But soon enough, he’s sneering with a lurid malevolence, and the character is revealed to be the architect of the demonic invasion. Spiner is clearly having a blast inhabiting Sydney, sliding between different registers of villainy—going from quietly threatening to full-on thunderous malice, sometimes in the course of a single scene. It’s a charge to watch someone who famously portrayed a lack of emotion revel in doing horrific things, adding a fun layer of meta enjoyment to the character. There was a two-year gap between the first season of Outcast and the second—in America, anyway. (It aired in the U.K. a year ago.) The delay wasn’t on the production end, so it’s unclear why, exactly, the huge pause occurred. (Cinemax didn’t respond to our request for a comment on the delay.) Unfortunately, that means the production’s options on its actors expired quite some time ago, putting any additional seasons in the “very unlikely” category. It hasn’t been canceled yet, but it would be an enormous undertaking to put together a third season, and the show is relatively expensive to make. It’s unfortunate. Season one was a tightly plotted, engrossing (and often just gross) story arc, and season two looks to continue that trend. Look, there’s a simple answer as to why people aren’t watching Outcast: It’s on Cinemax. The pay-cable channel has always struggled to crawl out from under the shadow of HBO and Showtime; even Steven Soderbergh’s The Knick only made it two seasons, and that show received far more attention and acclaim. But while the lack of notice is understandable, it has no bearing on quality, and Outcast is a show deserving of your attention. Just make sure you’re setting your drink down before it starts—cleaning up spills because you jumped in fright is never fun.